KATIE: Way to ruin a perfectly good nap, Waffles. WAFFLES: You don't like my song, Boss? KATIE: I was hoping for a little Simon & Garfunkle. KATIE: I was hoping for The Sound of Silence. While continuing to unpack boxes today, Glogirly realized she hadn't seen Katie or Waffles since breakfast. She looked high and low, checked out every sun puddle, but no Katie and no Waffles. 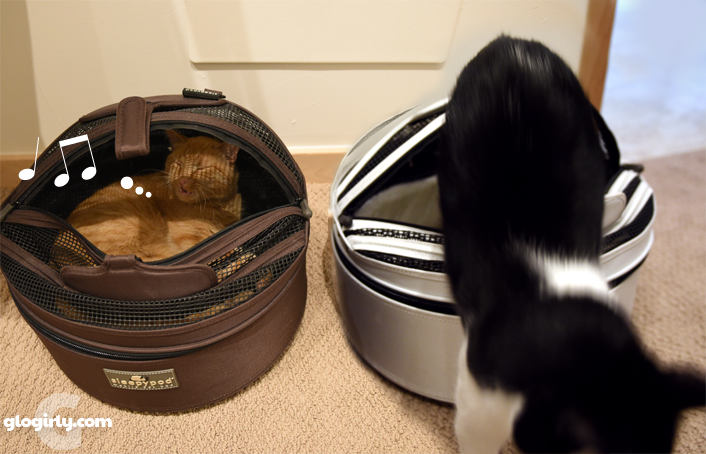 It wasn't until she flipped the light on in the closet to grab a sweater that she found them napping side by side in their Sleepypods. Sorry, Waffles, but judging by those lyrics I'd be with Katie on this one..... Have you thought about getting one of those iPAW Touch devices and earphones? Just saying. Sorry Katie.... it looks like Waffles is on a roll. Hope you find a quiet place to nap! 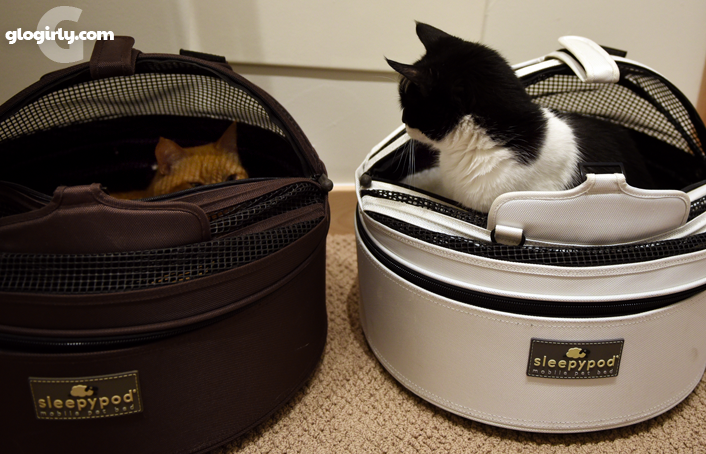 Those Sleepypods sure are popular with those two! 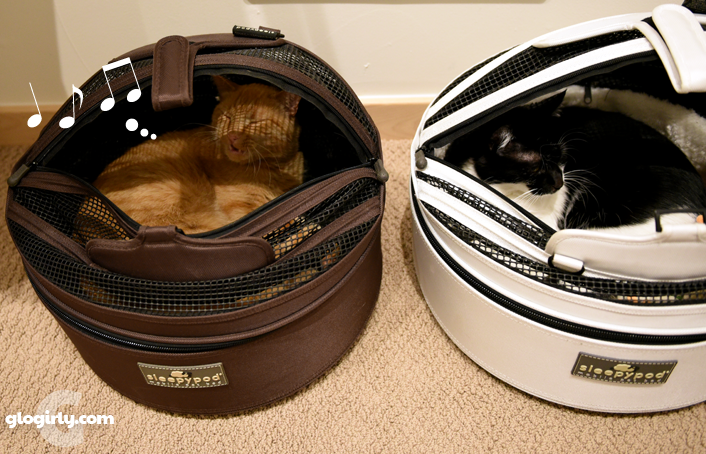 Those sleepypods make pretty good napping spots...and for Waffles, singing spot. Everytime I see your sleepypod, I want one. But then I realize M could never pick me up in it because of her back. Oh well, I'll just dream of yours. Ah Waffles, we were only warned about one earworm and there were TWO! Waffles, we loved your songs. Those sure must be comfortable! Great napping spots you two! Katie needs to learn to appreciate song transformations. Small, dark, cozy places. Where better for cats to be?